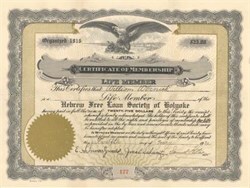 Beautifully engraved membership certificate from the Hebrew Free Loan Society of Holyoke issued in 1930. This historic document has an ornate border around it with a vignette of an eagle. This item is hand signed by the Company’s President, Treasurer and Secretary and is over 72 years old. The Hebrew Free Loan Society was organized as a group to help these new Jewish immigrants realize their dreams. Guided by the spirit of Chevra Gemilus Chasodim, translated as Deeds of Loving Kindness, this group of Jews aimed to make interest-free loans to fellow Jews in need.